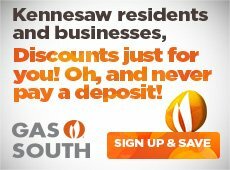 Any individual, partnership, corporation or entity which engages in any activity with the object of gain, profit, benefit or advantage in the city limits of Kennesaw is considered to be engaged in business and must obtain a Business License/Occupational Tax Certificate for each location in the city limits of Kennesaw prior to starting business. Applications can be found by visiting our Document Center. New businesses must apply for an occupation tax certificate prior to beginning operations. An existing company must renew its certificate and pay taxes each year, no later than March 31. Occupation tax certificates are issued by the Business License Office Monday through Friday, 8 a.m. to 5 p.m. You may fax your completed application to 770-429-4559. You will be notified of the fee and any additional documentation required. The deadline for occupational tax certificate renewals is March 31 of each year. All payments received after that date will be assessed a 10% payment penalty and 1.5% interest per month. Please contact the Business License office at 770-424-8274 if your business closed in a prior year. Home Occupation Affidavits: Home Occupation Affidavits must be approved by the Zoning Department prior to issuance of a business license for all home based businesses. Call 770-590-8268. For building construction, repairs, permits, air conditioning and heating inspection, building inspection, plumbing inspection, electrical inspection or building permits, contact Jammie Newsome at 770-429-4554. Any monies owed to the City for license fees, permit fees, utilities and taxes must be paid prior to any licenses or permits being released or the conduct of any work in the City being done. New construction or renovation done prior to a business occupying a new facility or building shall meet all code requirements for permits and licenses. Further, a Certificate of Occupancy and a Business License must be issued prior to the business beginning operation. To summarize, each business shall be in compliance with all aspects of the City of Kennesaw Code prior to beginning operation in the City. Below is a list of additional services that may be required to conduct business in the City. All new business license applicants and existing licensees shall attend an alcohol sales and service workshop for owners and managers on a workshop approved by the Business License Manager.